Edgar Allan Poe Cottage – New York City: Poe spent the last years of his life in a cottage in The Bronx, now referred to as Poe Cottage. It is part of Poe Park, also located in the same area which opened in 1902. Poe rented its white farmhouse, now known as Poe Cottage, for $100 a year from 1846 to 1849. Built in 1812, it was here Poe wrote “The Bells,” “Eureka,” and “Annabel Lee,” while living with his wife Virginia. At the Edgar Allan Poe Cottage he wrote some of his last works, including “The Cask of Amontillado.” You can visit in a group tour or tour the cottage individually, which is $5 per adult and $3 per child, student, and senior citizen. Edgar Allan Poe National Historic Site – Philadelphia: Poe considered the time he spent in Philadelphia to be the most productive in his writing career. At the Edgar Allan Poe National Historic Site, visitors can learn about the history of Poe, his life, and his career. Filled with interactive exhibits including posing with The Raven, viewing the rooms where he wrote, and an audio tour, this site is filled with everything Poe. Edgar Allan Poe House and Museum – As well as his grave, the Edgar Allan Poe House is where he wrote some of his earliest works and is also located in Baltimore. Poe Baltimore is a museum that exists within his preserved home, and it lets fans of his work see the desk where he wrote and even the glassware that he drank from. According to their website, admission is $5 for adults and $4 for seniors (65+), active military with ID and students (ages 13-21) with ID. 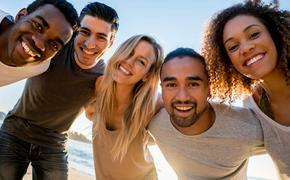 Children 12 and under are free when accompanied by an adult. George Peabody Library – Baltimore: Another Baltimore-based exhibit, this Library is running an Edgar Allan Poe exhibit until Feb. 5, 2017. This exhibit shows the real life works of Poe, including his first drafts and publications of a variety of his works. It’s free admission so fans of Poe can see his handwriting up close, including writing from The Raven. 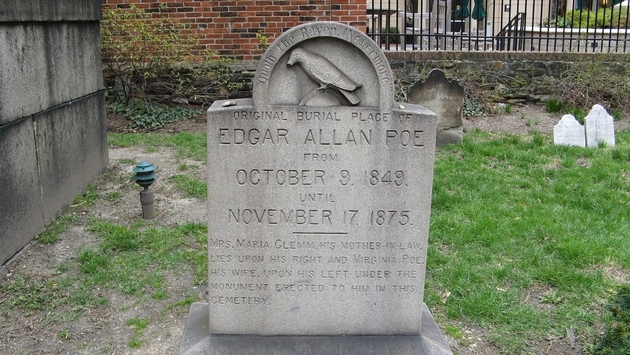 Poe’s Memorial Grave – Baltimore: Edgar Allan Poe died on Oct. 7, 1849 in Baltimore, Maryland. Westminster Hall serves as the location for his grave, which is located in the burying grounds and catacombs. The grave includes a relief of Poe that is actually the fourth one used for the grave, as the last ones were either weathered down or stolen. You can pay for a tour of the catacombs or you can visit yourself for free.